Most of my holidays revolve around diving, or a place where I can at least snorkel, and the colour dominating my thoughts is always blue. Christmas Island�s waters are certainly that, crystal clear and a strikingly deep cobalt blue. Like the Galapagos, Christmas Island has a high rate of endemism because of its isolation and three quarters of the island is national park. This time around though, a colour at the other end of the spectrum filled my every waking thought in the days leading up to my trip to the isolated island in the eastern Indian Ocean. 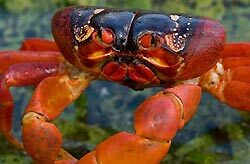 All I could think about was RED, and not just any red but that particular red which gives red land crabs their name. It was my mantra, red, red, red. And I wasn�t alone. There were many keen photographers, videographers and observers at Ethel Beach for the start of the annual red land crab spawning on December 1. 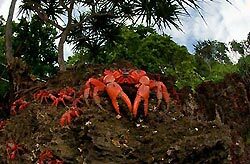 At the start of the rainy season millions of mature red land crabs migrate from their forest homes to the shore to mate, brood and release their eggs. It is hard to fully grasp the scale of this epic event until you see it in person. The timing of the spawnings depends on the rain, which triggers the crabs to start their migration, as well as other conditions like the moon cycle and tides. 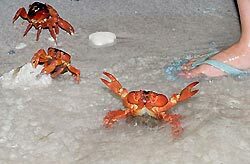 The crabs will only release their eggs before sunrise on the full moon and at the top of high tide so that their eggs are washed off the reef under the cover of darkness. Spawnings last three to four days and the female crabs stop releasing their eggs once the sun comes up and they risk drying out. Red land crabs were everywhere! From the footpath outside the airport to my hotel door, red land crabs were going about their business, secure in the fact that this was their island. 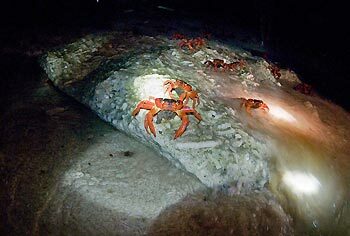 The crabs are protected, as are many of the island�s animals, and many roads are closed during the spawnings. Drivers are also warned to drive cautiously and give crabs the right of way. As we watched the natural event unfold by torchlight I heard one man mutter to himself: �It�s the experience of a lifetime�. Witnessing the culmination of a massive migration undertaken by millions of crabs is an awe inspiring experience, yet I couldn�t help laughing at the female crabs as they did their dance - the crab disco. �When a wave washed up the beach the crabs raised their pincers in the air, leaned back on their hind legs and then there was a whole lot of shaking going on as they released thousands of tiny brown eggs into the sea. If you do travel to Christmas Island for the crab spawning, I highly recommend staying on the island or return to see if the baby crabs return (three to five weeks after a spawning). 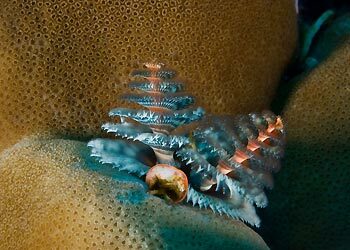 The eggs released during the spawning go through seven larval stages in the ocean before becoming miniature replicas of their parents. 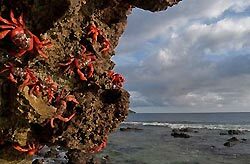 When the baby crabs return en masse, it�s like their parents� migration in reverse as the fingernail-sized crabs emerge from the sea and cover the shore in a fine pink tide. The baby crabs� return depends on a variety of factors such as weather, currents and predation, so each year varies. Last year was a good year, while this year hardly any came back. If you stay on after the end of the spawning, then you will also have much better access to explore the island�s many lookouts, hiking trails and natural features such as the blow holes, the roads to which are closed during the spawnings. 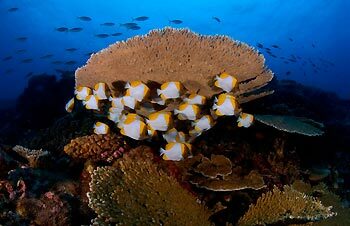 During the day, after finishing watching the spawning there is some fantastic diving and snorkeling to keep you occupied. �As Christmas Island is at the top of an underwater volcanic ridge, and colourful coral reefs blanket the shallows and dramatic drop offs. 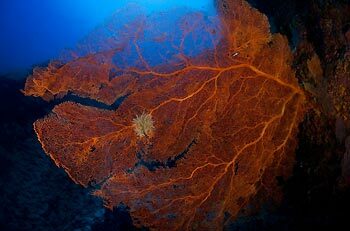 Gorgonians are found in just a few metres of water and near the entrances to many of the sea caves as well as along the deeper walls. Whale sharks, along with the red land crabs, are the poster animals for the island and can be spotted year round but most reliably over the summer. Other pelagic species include manta rays and spinner dolphins, which I was lucky enough to snorkel with five days in a row.